Candles à la Jo Malone! Ok, so this post is not yarn related in any way. If you came here to read about colourful crochet projects, I'm really sorry! I promise you there will be PLENTY colourful happy crochet projects on this page in the near future, but for now I can't give you any of that. I CAN however show you my latest creations! Which are almost as awesome as a crochet project! As you guys know, I'm Dutch. Us Dutch people, are known for being stingy and we love to save a buck (or euro) wherever we can. 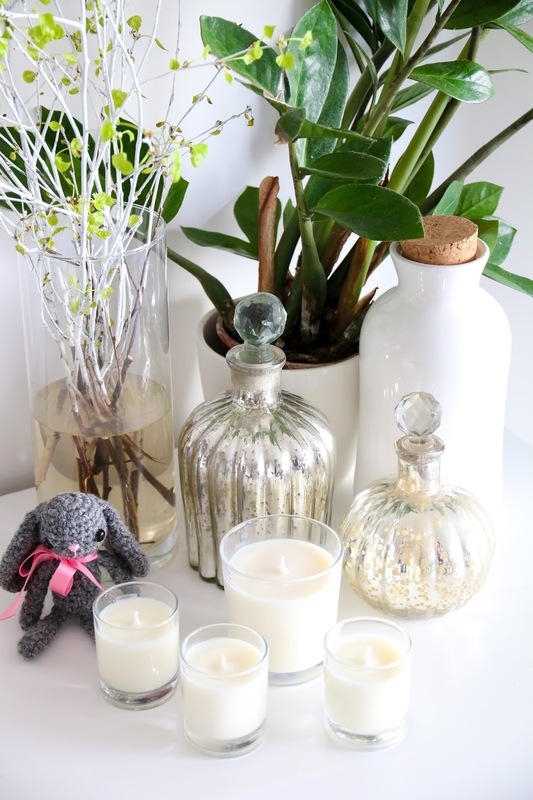 Now are you guys familiar with the Jo Malone candles? I first read about them in one of the Shopaholic books by Sophie Kinsella (GO READ THEM NOW IF YOU HAVEN'T YET!). I didn't know what the fuzz was about, until I smelled some of them in in the shop. Let's be honest, the smell heavenly, I absolutely can't deny that. Neither can you ;-). But have you looked at the price tag? I'm not saying that it's not worth the money, maybe it totally is, but I can't really afford to buy them on a monthly basis. In fact, I've never purchased one in my life, neither have I been gifted one (in case my parents read along: hint hint). 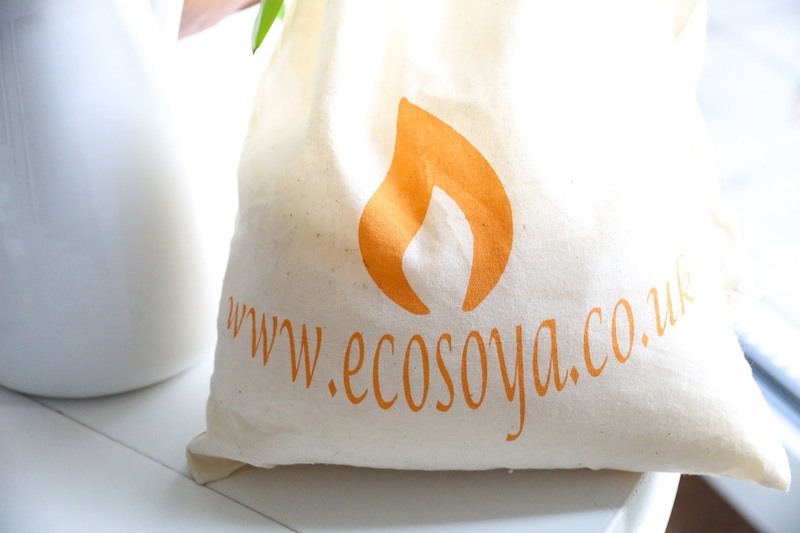 They burn cleaner, have no toxins, carcinogens or pollutants. There's no petrol-carbon soot like you would get from petroleum-based paraffin candles. They are also longer lasting. 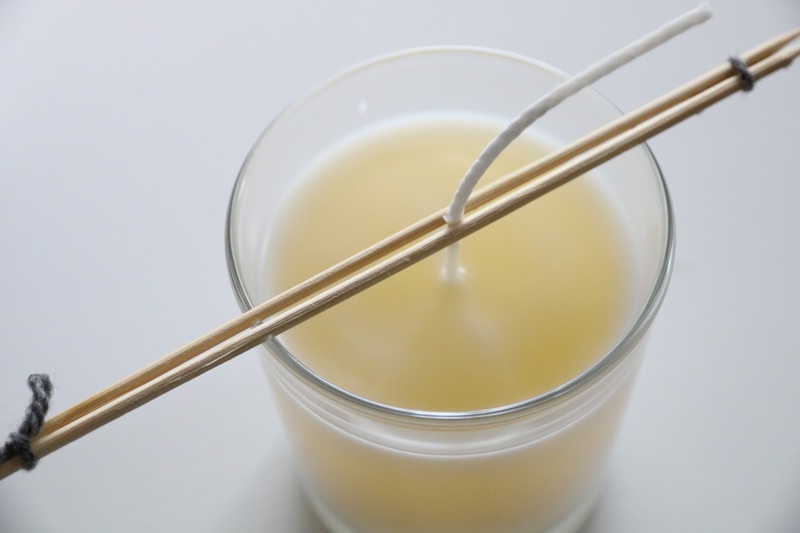 Soy wax burns cooler which means that you can enjoy your soy wax candle for generally 30-50% longer than a paraffin candle! I also ordered some wicks and perfume oils from Scentperfique in the UK. The reason I ended up ordering from this website, is because they did perfume oils in the style of other famous perfumes, like some of the Jo Malone scents, but also from other perfume brands. The scent I absolutely adore from Jo Malone is Pomegranate Noir. 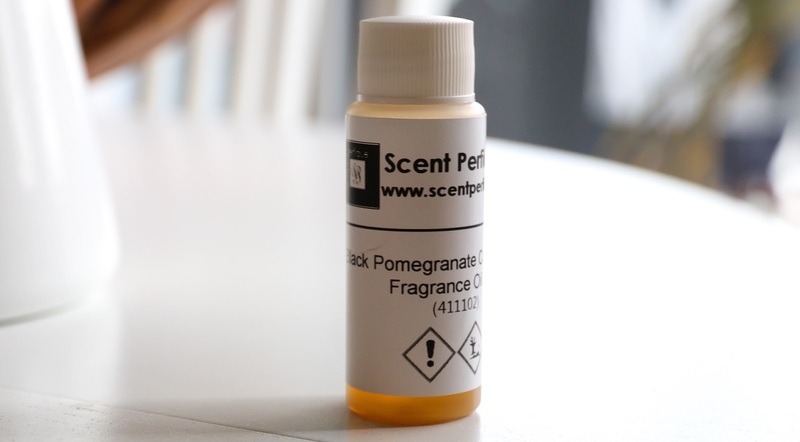 Scentperfique have a very similar perfume oil which is called Black Pomegranate. I also purchased some whiskey glasses from our supermarket, which came in a pack of 3 for €2,50 which was not too bad. They hold about 200 ml, which is a good size I figured. I didn't want to make a lot of candles on my first try, so I decided to use only 1 of those glasses, and 3 tiny little glasses I had lying around. So, how to do it you might ask? 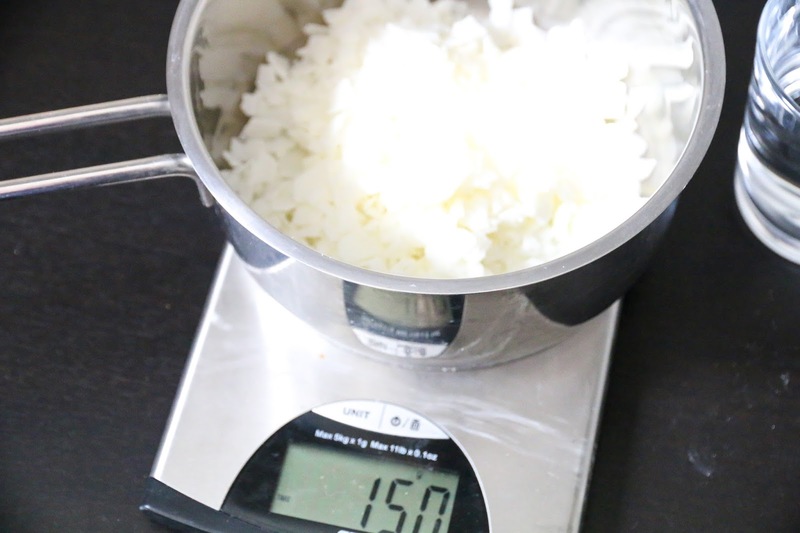 First of all you have to weigh out the amount of wax you need for your container. 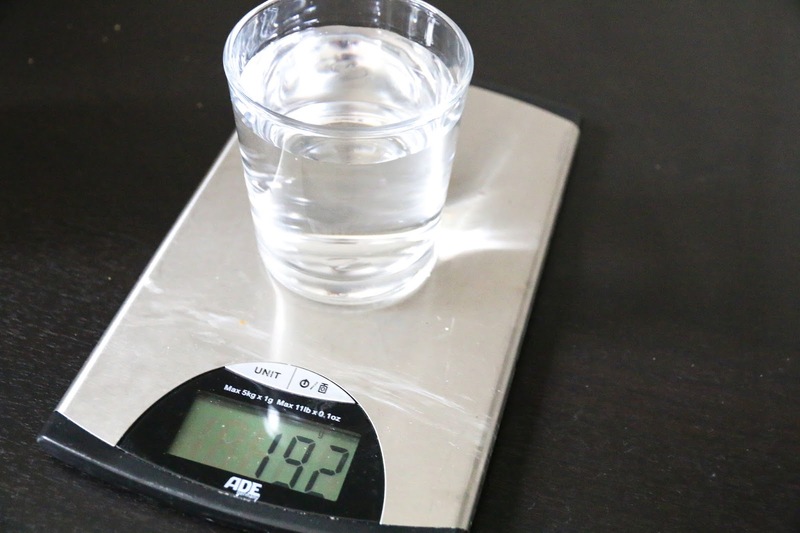 They way I did it was by filling my glass with water and weighing the amount of water. I deduced that by 20% and that should be the amount of wax you're going to need. You then weight out the amount of wax and melt it using the double boiler method (or in my case, a bowl on top of a pan with water). 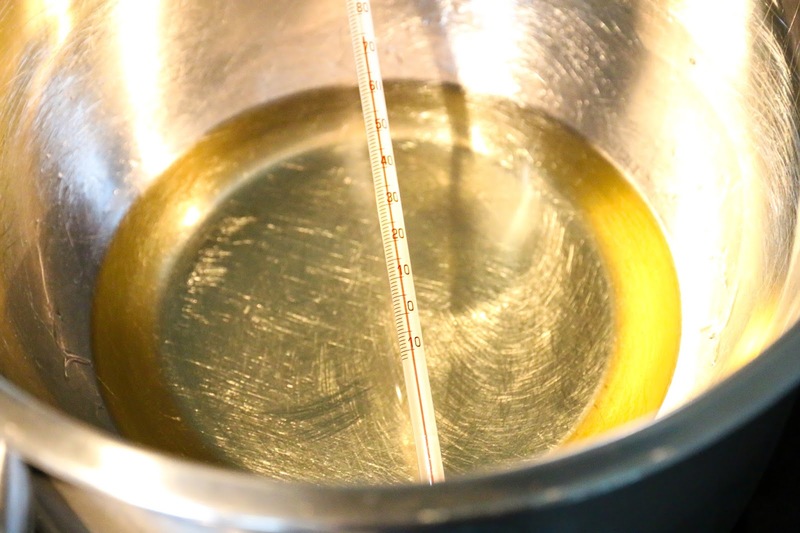 Once the wax has reached about 80 degrees Celsius you can take it off the stove, add the perfume oil, and let it cool to around 57 degrees. In the meantime, you should have already prepared your glasses by placing the wicks inside. I used a dot of hot glue, and centered the wicks in my glasses. 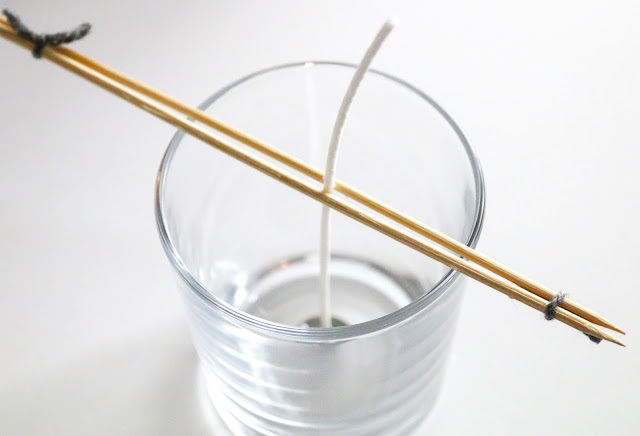 I also made sure the top of the wick would stay in place, by using two wooden skewers per glass which i tied together on each side with some yarn. 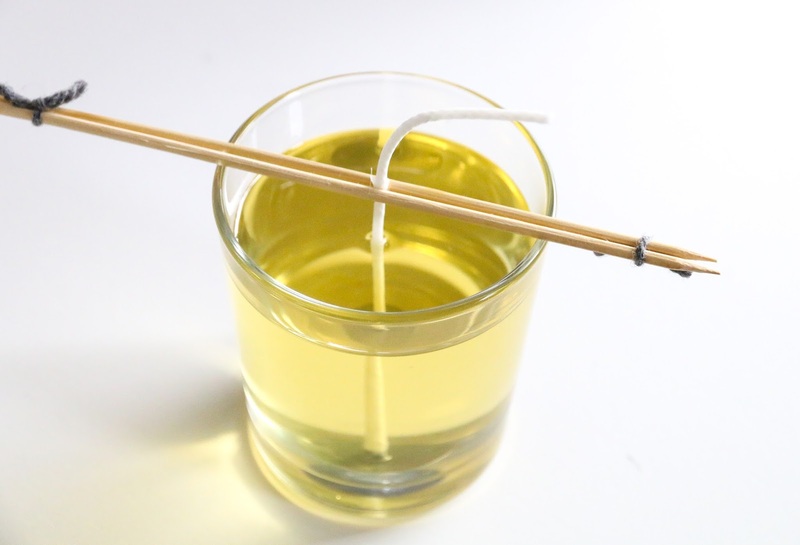 You place the wick in between, and pull it upwards and to the center. Now they're ready to be filled! Apparently it's important to pour the wax around 55 to 60 degrees Celsius, to prevent a sink hole in the middle of your candle. It's also important to pour slow, but steady, so that you don't introduce air bubbles or splash the sides of your glass. It went pretty well I must say, although the small candles were a little harder to fill, since I didn't have a proper pouring jug for my wax. I poured it straight out of the big bowl, which was my own stupid fault. I did get all 3 little glasses filled, so I was happy! It all smelled soooooo good!!! I used Black Pomegranate for the big glass, and Black Orchid for the three small ones. By now the candles were starting to set, which went really really fast. They started out as this yellow see through liquid, then became a little cloudy, and finally turned into this beautiful creamy white! I read that you have to wait a minimum of 24 hours though, so I couldn't light them yet, but at least I could admire my creations! I think they look absolutely perfect!!! It smells lovely, but isn't overpowering at all. The flame is very stable and calm. My first candle!!!! So very proud!!! I can't wait to try the small ones as well! I might just light one in the bathroom tomorrow before I take my shower! 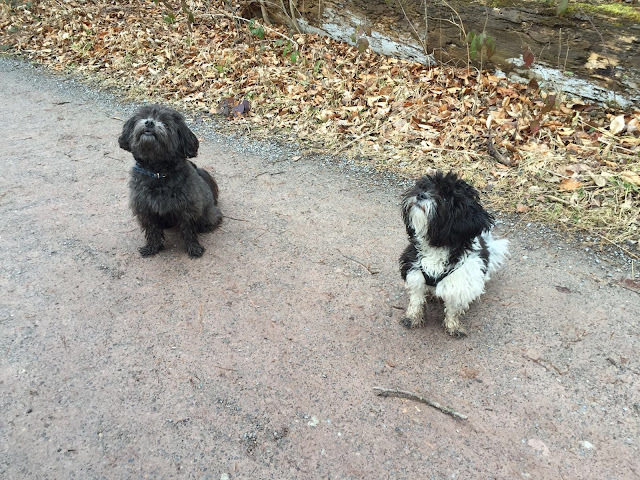 Poppy had a lovely day today, as we met a good friend of mine who has a little doggy as well. Her dog's name is Hayley and she's the same breed as Poppy. She's actually the reason we bought Poppy! We used to babysit Hayley from time to time, and fell in love with this breed (Bolonka Zwetna). We took a nice long stroll around the "Bärensee" here in Stuttgart. The weather wasn't amazing, but it was still nice being outside. We stopped at a nice little restaurant where we were allowed to take our dogs inside and enjoyed a cup of coffee and some homemade cakes! A lovely afternoon it was! 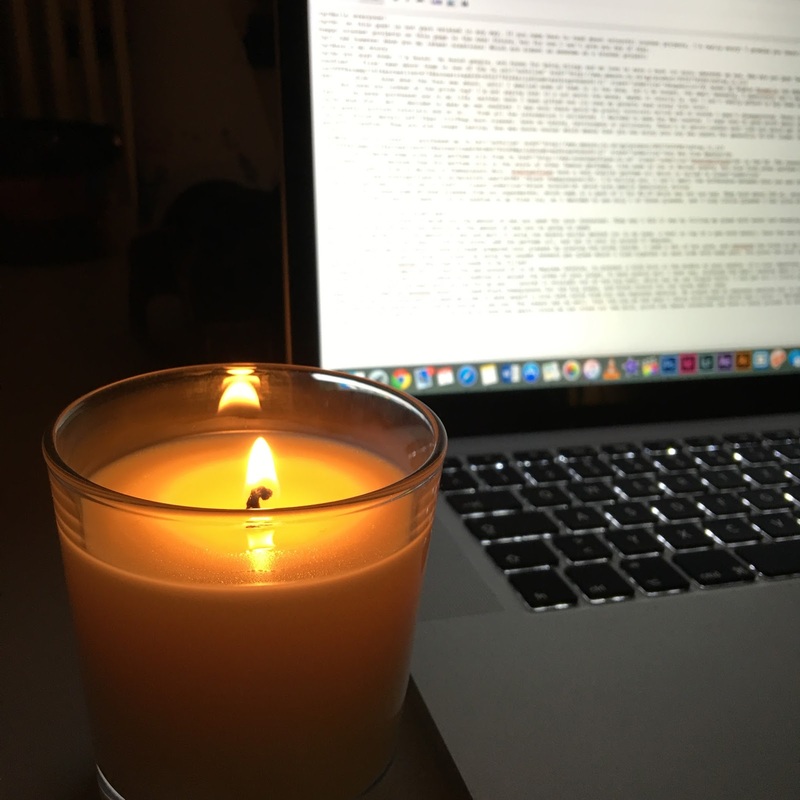 I've been sitting behind my laptop blogging for quite some time now and just realised that it's completely dark here except for my "Dennis 'Malone' Marquez" candle and the light from my laptop. I keep getting wafts of that lovely scent and I feel totally happy. I hope you're all having a lovely week! 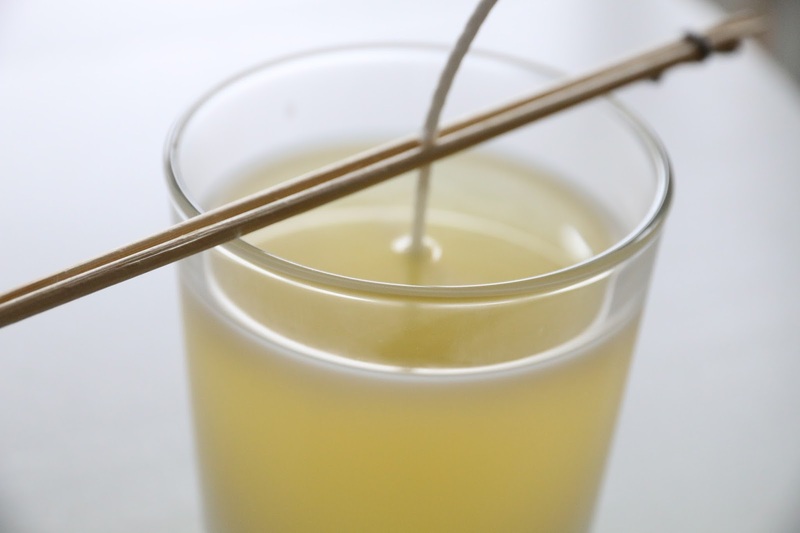 Have you guys ever made candles before? 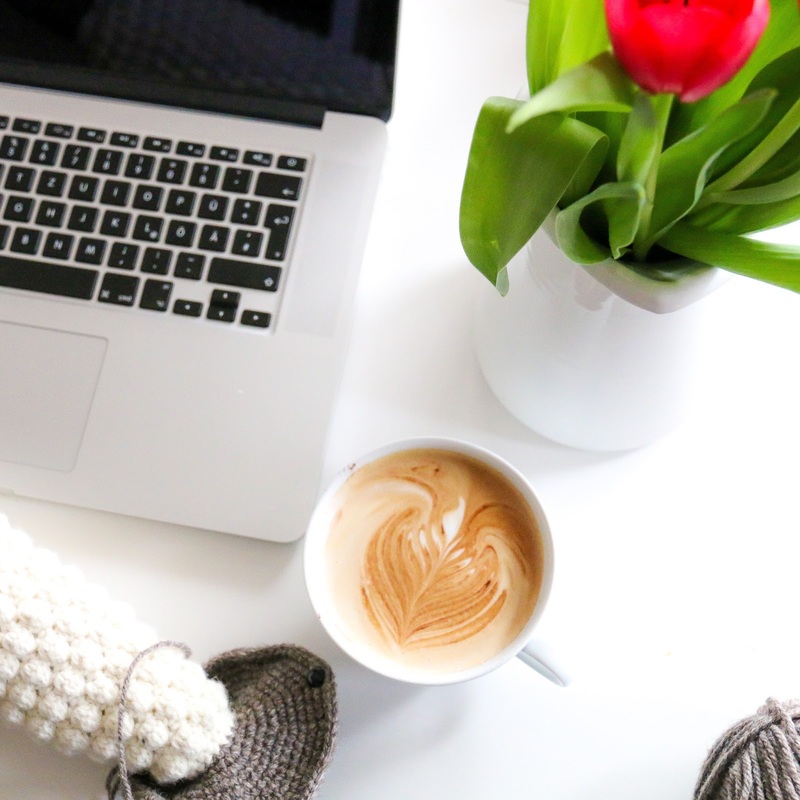 Let me know below, you might even have some more tips for me! Ooh Dennis Malone candles! can see them in the shops already! aren't they a bit naked though? Could they do with some crocheted covers??!! I've been making bath bombs, I was paying so much for them and it turns out that they're ridiculously easy to make - lots of advice and recipes on Pinterest. 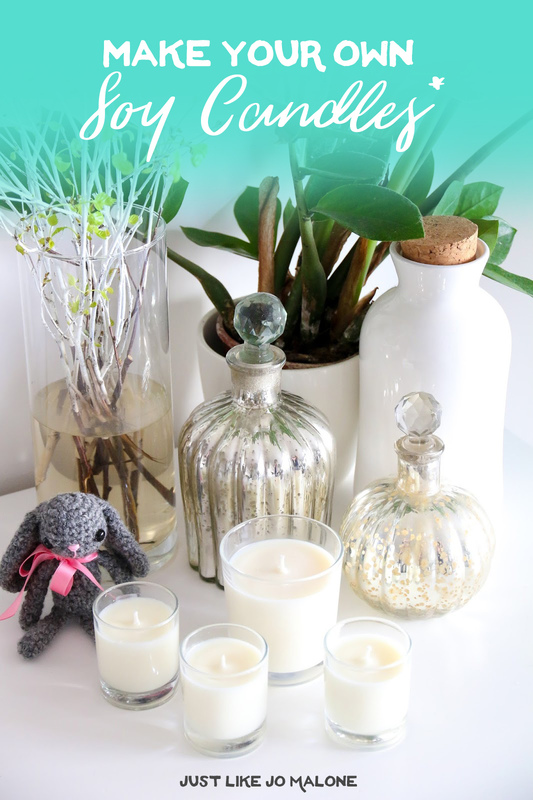 I'll have to have a go at candles now, then I'll have Christmas pressies all sorted! Ha Ha! I've got needle felting stuff, clay and fabric and enough buttons and ribbon to start a shop - I NEED them! now... cold porcelain? If anyone needs me I'll be on Pinterest! Gorgeous Dennis! I was gifted a beautiful big 'Wavertree & London' (Australian company- Ironicly named) soy candle for my birthday last year scented 'Japanese Plum'. Just exquisite! It was quite expensive so I have been thinking about also finding the scent and buying some soy wax melts to make my own. Im definitely going to make some now! Candle making was a big thing in the late 70s when I was a young married mom. We had molds; I remember a mushroom, an owl, even a sun shape. Cool artistic project. 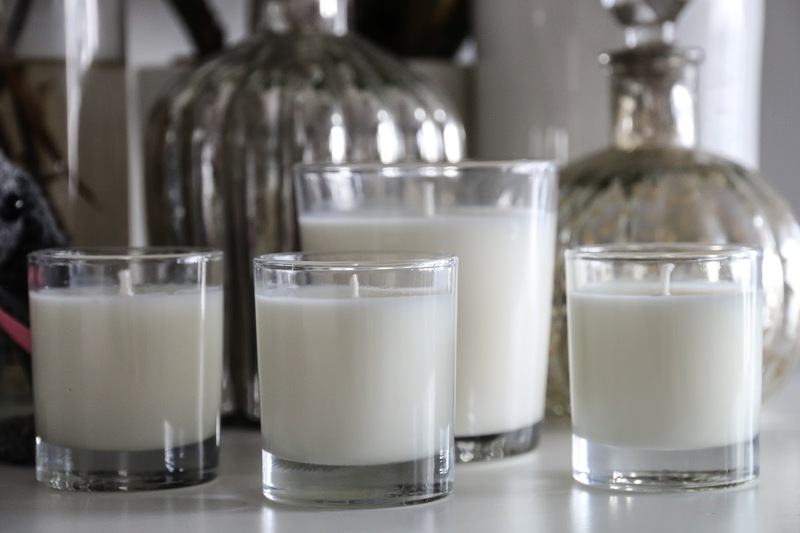 I can see your white candles with lovely flower petals inside near the edge of the glass. I don't know how you get them to stay as you pour the wax but shells, small beads, pebbles and colorful petals give the candles a very distinct look. Can I ask how much oil you used please? So glad you two are blogging again! I love what you did with the candles and your explanation was totally clear. Gives me the desire to make my own now. Could you tell me what espresso machine you got? My husband can't seem to find one that lasts. He's driving me nuts continually buying new ones. I notice (too late) that you used concentrated oil when you were candle making. I followed your blog but brought by mistake the ordinary fragrance oil. Could you tell me what ratio of oil you used to wax. My candle has turned out beautifully but not getting the beautiful perfume when burning it.